What do you do when you are left with your niece and you can’t afford to feed her? You give her to a local dragon, in hopes a wealthy man will rescue her, of course. They will be married and all your days of hard work will be over, right? Except your niece is not an ordinary girl. Dragon Slippers is the adventure of a girl named Creel meeting dragons, princes, and ornery princesses When Creel is taken by a dragon, instead of cowering in fear and waiting for her rescue, she talks the dragon into not only letting her go, but also into giving her a very special pair of shoes. After Creel escapes the dragon, she makes her way to the city, in hopes of getting work in a dress shop. 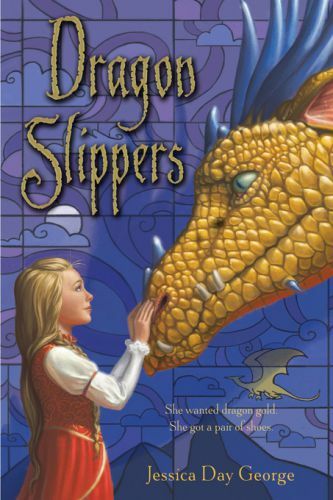 Wearing the shoes, Creel quickly find herself in over her head, running into bandits, other dragons and getting on the bad side of the future queen. Her shoes get her in constant trouble, until they cause the nation to hang by a thread. Can Creel figure out her shoes and save her country? I was surprised how much I liked this book. I was convinced I knew how the book was going to go before I even started reading. I was completely wrong, and in a good way. The dragons were fun, personable individuals who had unique personalities and added the perfect quirks to the story. Creel is very much a reluctant heroine, and she doesn’t fall into the girl turned warrior heroine mode. She does things in her own time and own way. This book is written in a way that women and girls of all ages will love. It is part of a trilogy, but it stands on its own really well. I currently have not read the other two books. It is a clean story, one that I would let my own child read. Creel is really a wonderful heroine. My kind of girl. She doesn’t want to be at the center of attention, but she will do what she needs to do to protect those she cares about. She is intelligent and outspoken, the kind of girl that doesn’t wait around to be saved, but is going to save herself. I considered this book a fluff book, not full of life changing information, but it is a delightful story and easy read. If you like fantasy, this book is for you. Sounds like a cute story. I love the cover art!